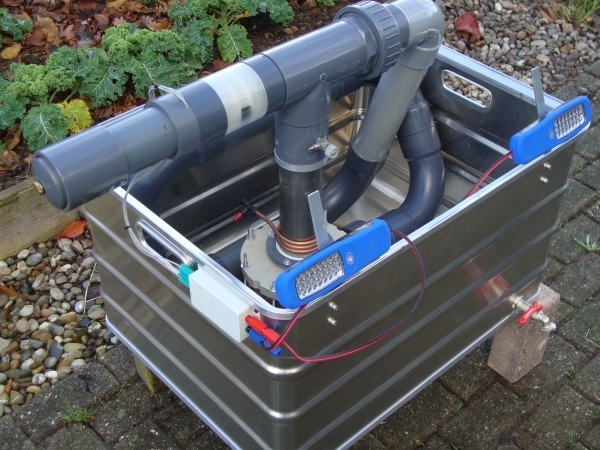 At the “Bioenergy Innovaton Program 2012 partner day”organized by the FACT foundation and held last week in the Netherlands, Aster demonstrated a functional prototype of the combined water heater and thermoacoustic generator for use in rural area’s. 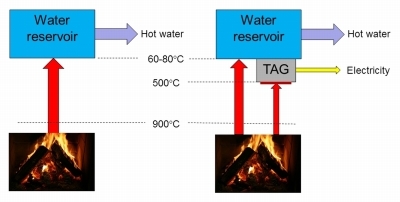 This thermoacoustic generator utilize the temperature difference between an arbitrary heat source (wood, gas) and the water to be heated for generating electricity. This is shown schematically below. 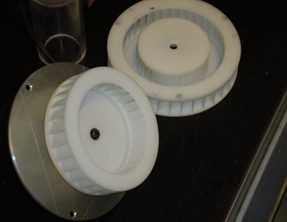 The single stage thermoacoustic engine is constructed coaxially with the high temperature heat exchanger positioned at the lower end for thermal contact with the heat source. The low temperature heat exchanger actually becomes part of the bottom of the water tank. 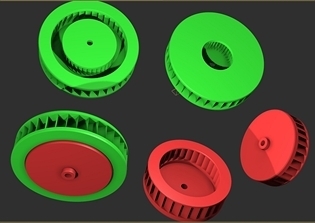 A potential cost reduction in this concept is the use of a small bi-directional impulse turbine equipped with standard rotating generator for the conversion of acoustic power into electricity (see previous posts). The left picture shows the thermoacoustic section. 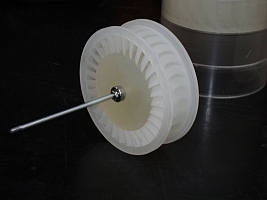 This unit will be placed on the bottom of the water tank in such a way that the hot hex protrude the bottom for interacting with the heat source beneath the tank. 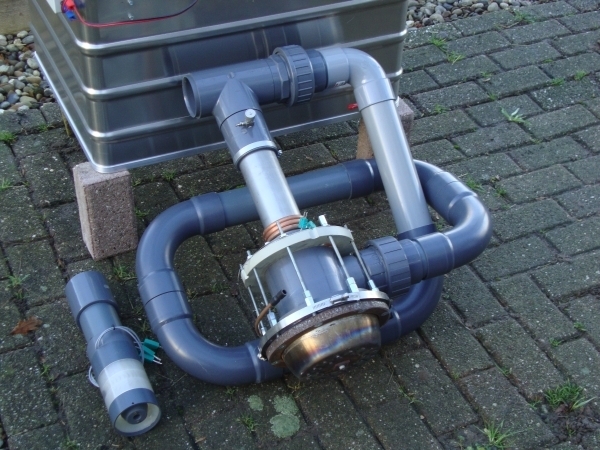 In the final version the whole thermoacoustic device is immersed in the water (not shown on this picture) for keeping the cold hex temperature low without the need for a circulation pump. 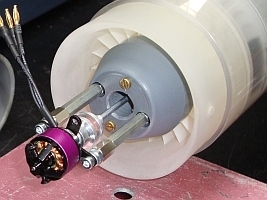 The demonstration was performed with air at atmospheric pressure which allows for visual observation of the turbine rotor. In this setting only 5 W electricity was generated for powering the led lights. Normal operation is with compressed air at 2-3 barg at which 50W electric output is aimed. In order to make this become true we are working now on an improved bi-directional turbine which can be pressurized as well. An option for further increasing output power or reducing the dimensions of the acoustic tubing is to apply a 2-stage thermoacoustic unit.